how do your patterns come? Do I have to print them out and enlarge them? Or do they come preprinted and just cut and sew? 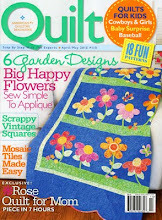 I will be at the Quilt Show in Minneapolis and would love to see your booth. I am opening a store in Colorado in August (hopefully). Are you taking appointments? Do you know your booth number? Hi! I was just wondering if you offer your patterns in pdf? If so, where can I find those? Hi, I am from UT as well and was just wondering if you have any specific store where I could go and buy, instead of buying online and paying shipping. I bought the Urban Diaper Bag and it did not include the changing pad and pacifier pouch instructions. Where can I get those instructions? Would love your patterns as pdf! It's so much easier and faster and so much better than thin tissue paper.